I prepared the tomatoes overnight in my Crock pot the night before. Place tomatoes and all other ingredients in Crock pot, omitting roux and cream. Allow to cook overnight, or long enough for the skins of the tomato to peel. I like to do this in a crock pot to really get the rosemary to infuse with the tomatoes. Remove tomatoes from the crock pot at this point and place into a large bowl. Leave a good amount of your broth together with the tomatoes. In a food processor or blender and add plum wine. Blend on high until completely incorporated. and there is a slight toasted aroma from the flour. You can add a bit of cream to this, but just enough to smooth. Set your roux aside to cool. fine strainer removing all seeds. Place mixture back into processor, adding a small amount of roux. Continue to blend, slowly adding roux until you have achieved desired thickness. If your bisque becomes a little too thick, add a bit more cream. Wow Rebecca you always feature the best! This looks so cooling...and delicious! Rebecca, what an interesting skewer...love the idea of sashimi and figs...yummie! this looks like an elegant soup and surely would impress any guest! Hi Rebecca, this looks lovely, and all the ingredients and flavors are great and refreshing. I follow The Ardent Epicure as well! This summer bisque sounds delicious and what an elegant presentation. Well done, Alisha! Top notch restaurant quality appetizer. Great job on the presentation! Oh I love the presentation! I love her blog (and yours), love this dish and boy do I have some serious blog reading to do this week! This is quite a sophisticated and special recipe. Great job Alisha! Fun and elegant dish..It is warming up here so looking forward to such food soon! I have really been enjoying visiting the Magic of Spice recently. Such a wonderful blog! This recipe looks crazy delicious! Ahi, figs...oh my! I had no idea what this concoction was and was intrigued by the picture, but after seeing the recipe I am even more intrigued by how delicious this sounds. Ahi tuna and figs, ooooh. I'm sure this tastes as wonderful as it looks - spectacular! wow! it was really delicious recipe! thanx 4 sharing! We are glad everyone enjoyed the recipe, and we feel privileged to be able to make a guest post here. Happy eating everyone! Awesome guest post! The food styling in the photos is fantastic. It sounds delightful! So much flavor in that little glass! What a gorgeous way to serve a yummy bisque. Great guest post!! Definitely "knock my socks off" pretty. Love the idea of doing the tomatoes in the crockpot to infuse the rosemary. Cold summer soups are my favorite! I love this concept! Ahi Sashimi-fig skewer with bisque... Sounds delicious and you've given it a glorious presentation. I think I cant get over "sashimi skewers" yup its a fact I am stuck on "sashimi skewers"
This looks so beautiful! Another quality guest post. Great guest post! Before reading the title I thought the bisque was a dessert of some sort. Beautiful presentation! Great guest post! I love Alisha and her crew. They're sweet heart! Sashimi skewers intrigued me and I had to follow the rest of the recipe. This looks refreshing, healthy, and tasty! What an elegant recipe and presentation! Thank you for sharing Alisha with us, Rebecca, and thank you Alisha for sharing this wonderful recipe! 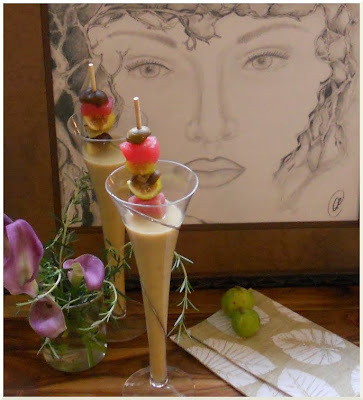 What a great guest post.. these look delicious.. perfect for a summer evening! Thanks -you are so great at spreading the word! This would be great for a dinner party with friends. Love it! Wow! This is definitely unique. Great presentation. Wonderful dish! Sounds delicious and looks beautiful. Wonderful post and absolutely gorgeous pictures. Just another example of the quality content to be found on The Ardent Epicure. Ooh...how fancy! What a great presentation. This recipe sounds delicious! I do enjoy The Ardent Epicure. Alisha's recipes are simply wonderful and this soup is fantastic. Great presentation as always! Alisha, great job with the soup and sashimi skewers! Alisha - that bisque sounds like a feast of flavours! Love the presentation. The background artwork is impressive too ! My first visit, great post! Looks delicious! An amazing combination of flavors and textures. Cool looking indeed. This is one of those dishes that I'd just enjoy looking at. Food makes the best centerpiece in my opinion. Although, I'm not sure I could let those figs sit there for long.